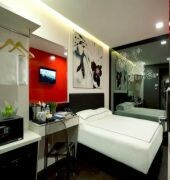 This hotel is located in Singapore (Geylang), near the airport, Parkway Parade, Haji Lane, and Singapore Flyer. Local attractions also include Geylang Serai New Market and Singapore National Stadium.In addition to complimentary wireless Internet access, Venue Hotel provides a business center, a grocery/convenience store, and a 24-hour front desk.LED televisions come with premium cable channels. Guestrooms also feature complimentary wireless Internet access, refrigerators, and air conditioning. 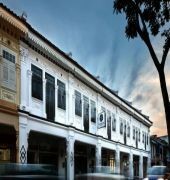 The VENUE HOTEL is a Tourist, Leisure, Heritage Building hotel. Located in City Centre - Geylang area. Shopping is within walking distance and the nightlife/restaurants are within walking distance from the hotel. 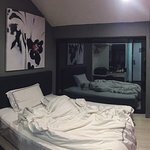 Descriptionclass="small" style="text-align: justify; font-size:11px;">This hotel is located in Singapore (Geylang), near the airport, Parkway Parade, Haji Lane, and Singapore Flyer. Local attractions also include Geylang Serai New Market and Singapore National Stadium.In addition to complimentary wireless Internet access, Venue Hotel provides a business center, a grocery/convenience store, and a 24-hour front desk.LED televisions come with premium cable channels. Guestrooms also feature complimentary wireless Internet access, refrigerators, and air conditioning. Smooth check in. Friendly and welcoming staff. Room is alright although the tray used to display the cups and tea sachets was very dusty. Pillow is too flat to our liking. Clean toilet. Location of the hotel is strategic and convenient to grab any food or visit any pub. Thank you for your kind words. We appreciate your input and will work harder to better improve the room services. If you are looking for a decent price no frills hotel this is the place. The room is small with no view but a huge mirror covering the entire wall. But I walked in and asked for a single room at 5am so am glad they actually had an available room. The receptionist doesnâ€™t make small talk and processed the check in in less than 5 mins. I was exhausted and am glad the staff didnâ€™t make me wait. Bed had a stale smell but you get used to it. They had the basic amenities of a hotel room, providing you with 3 different kinds towels. Shampoo, conditioner, soap, body lotion, shower cap, toothpaste and brush were also provided. Plus mineral water, complimentary tea. Couldnâ€™t ask for more. Toilet is a bit tight due to space constraints but if you are there for a nightâ€™s sleep this is a good hotel. Checkout was painless and within 5 seconds. Superb place to stay specially if ur single, rooms are small though but well maintained and the best available at the rates charged by the Hotel, simply superb, must try budget hotel 5 star facilities. Staff are also very helpful and very well behaved. We are glad you had a great stay with us. We hope to welcome you back with us. We value every comments and feedback and will work towards improving our service standards. We wish you a great day ahead. Stayed for three nights at the Venue Hotel. Hotel staff were very friendly and helpful. Our room was small but all that we needed while exploring the city. Very clean. MRT station is a 10 minute walk away and can get anywhere quickly from there. Would stay there again. Thank you for taking your time to write us a review. We wish to serve you again in the near future.